Both medical and recreational marijuana industries are on the rise, and they’re likely here to stay. Medical cannabis is now legal in 33 states (including Washington D.C), which means more than half of the United States have legal dispensaries. And, according to an analysis by the Marijuana Policy Group, the cannabis industry has created almost 18,000 jobs in Colorado alone since adult use was legalized there in 2014. Dispensaries are popping up across the country like hot-cakes. These are legitimate businesses (sans much funding) with a growing clientele. In addition to the increased number of dispensaries per state, this industry functions much like any other. There are industry events, expos and conferences for businesses to connect with potential partners and customers. Marijuana Business Daily will held three conferences called in three cities in 2018, and many attendees may also be interested in the Cannabis World Congress and Business Exposition. Above and beyond, the need to differentiate your brand from another is just as great as compared to any other industry. We’re the Promo Know-How People here at ePromos, and no challenge is too great for us to conquer. We have some great ideas to create branded giveaways for your next trade show. In addition, we now offer branding ideas for retail-type items for sale at smoke shops or dispensaries, as well as fun ideas for local events. 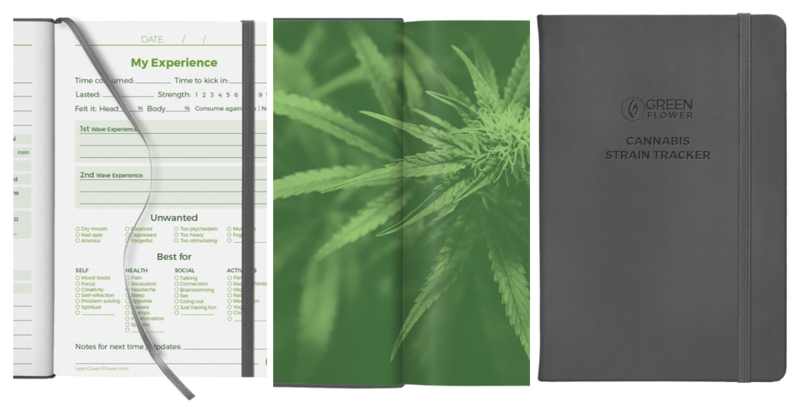 Rolling papers are an easy and affordable way to advertise your products and services. Made of 100% unbleached hemp, rolling papers make an easy, travel-friendly giveaway for a convention. Similarly, they make for a great gift-with-purchase at dispensaries and tobacco shops. No harmful chemicals or accelerants are used in the adhesives, made of natural Arabic gum. This product, which includes 32 rolling papers per pack, is a generous handout for your customers! Imprinted with your branding, these custom rolling papers will keep your clients coming back for more! Our imprinted BIC® lighters are perfect for businesses in the cannabis industries that want to keep their name in front of customers. These lighters are cost-effective branding tools, useful to medical and recreational pot smokers. With these lighters, there is also potential for brand exposure among the cigarette smokers within your target audience. BIC® is America’s number one preferred logo lighter. In addition to the guaranteed 3,000 lights per lighter, this product has a Child Guard system. BIC® lighters can deliver some great marketing with crossover appeal. Your company can imprint vertically or horizontally on both sides of the lighter. With eight colors from which to choose, you’ll find a design to match your logo. For medical dispensaries or smoke shops, ePromos recommends selling Small Pill Bottles with (or without) Candy. Brand the label with your business logo or other artwork! 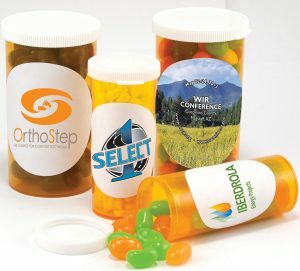 Fully-customizable pill bottles not only advertise your company, they are a great option for customers to store their cannabis. Bonus: some will enjoy the candy before they do! Medical dispensaries that want to promote overall health, along with the benefits of medical cannabis, can put their full-color logo on containers of Sanitizing Sprays, like other promotional products. ePromos carries a comprehensive range of sanitizer products, from tubes to sprays and hand wipes. 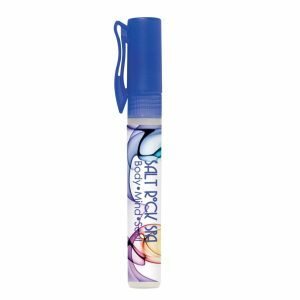 This spray has .27 ounces of lightly-scented disinfectant that is effective at eliminating over 99.9% of germs and bacteria. The durable plastic container easily fits in a pocket or purse and has a convenient pocket clip. Your logo can be printed in full color on the all-white label. Meets all FDA standards. Snacks are a great way to tell customers you “get them”. 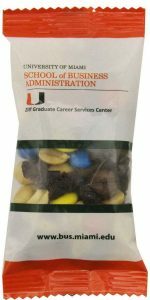 Filled with 1.25 ounces of delicious trail mix, these Trail Mix Snack Packs are protein packed and sealed to retain freshness and flavor. The 5” bag is also the perfect place to feature your dynamic full-color logo, which can wrap all the way around the package. The packaging also has a die-cut window to reveal the contents. The branding possibilities are endless on this item. This 192 page journal provides educational information and gives recipients the opportunity to log how each product affects them. 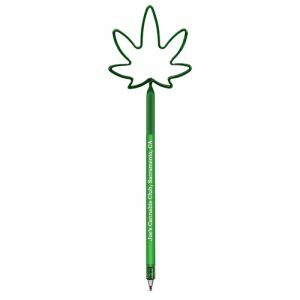 Looking for specific marijuana leaf items? This novelty pen is always a hit. Remember, not all promotional products need to revolve around smoking. Businesses can make their shops the place to stop with the right vibe. Selling t-shirts, embroidered caps, candles, essential oils and mood-changing shot glasses are other great options to boost your brand (and your profitability). Indications are this industry will only grow (pun intended) in the future. Your business can grow too, with products branded with your company’s logo. Forward thinking businesses are wise to take advantage of the promotional products ePromos has to offer. If you’re looking for ideas or support in customizing your merchandise online, our brand and graphic specialists are awaiting your call! Interested in keeping up with what’s hot and new in the promo world? Follow us on Facebook, Instagram, Twitter, Linked In and Pinterest!